In with the new, out with the old – seems like the guiding philosophy of fantasy owners these days, doesn’t it? We’re all about the shiny new toys; we want the next big thing. We’re drooling over guys like Rashaad Penny and Derrius Guice. Saquon Barkley is being fitted for his gold jacket as we speak. It’s gone too far. I’m not saying ignore the rookies, just cautioning against the premature disregard of players in the face of advanced stats, metrics, and analytics player profiles. These five running backs, quietly headlined by Peyton Barber, have been tossed aside by the fantasy community like clothes given to a five-year-old at Christmas (I always hated that). Upon closer examination, they can actually provide late-round value in fantasy football drafts. The Tampa Bay backfield is a perfect example of this. 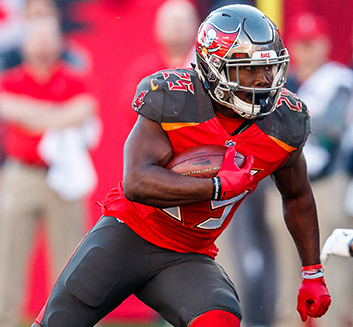 Peyton Barber is the uninspiring sweater Grandma gifted on your sixth birthday, while rookie Ronald Jones is the toy rocket from ‘cool’ uncle Randy. Despite its coolness, that rocket nose dives into oblivion within seconds of taking it out of its package. And while Grandma may not have the best taste in presents, the practicality of the warm knitted sweater (not the itchy kind) really comes in handy on those cold winter evenings, doesn’t it? This is exactly the Buccaneers backfield. The Bucs selected Jones in the second-round and it’s expected he will see a significant opportunity as a rookie. However, there are concerns about Jones’ receiving skills, as well as his ability to be a consistent runner between the tackles. This is where Barber can carve out a role. As the team’s primary rusher in Weeks 13-17, Barber averaged 4.3 yards per carry, 2.68 yards after contact, and had a 92.3 catch rate. He is a legitimate threat to Jones’ workload and could conceivably see enough touches week-to-week to provide fantasy relevance. Even better, his ADP is well below Jones’ making Barber the more valuable commodity in the Tampa Bay backfield. Barber is a guy you can find at the back-end of your drafts and is particularly valuable in best ball formats.Barber, while not the home run threat of Jones, possesses the proper skillset to be a solid receiver and inside runner. In 2017, Barber had an impressive Juke Rate of 27.4 percent and Yards Created average of 1.52, good for No. 17 and No. 14, respectively. Despite limited opportunities during the first half of the season, Barber still finished 2017 with the 18th most goal line carries (6) among all running backs. C.J. Anderson was a 1,000 yard rusher in 2017. #NotFakeNews That’s right, Anderson finished ninth in rushing with 1,007 yards. He did this by owning a 54.8 percent opportunity share and 57.7 percent snap share in the Denver backfield. Anderson evaded 78 tackles (No. 8), had a Juke Rate of 28.6 (No. 13), and a Yards Created Per Carry average of 1.43 (No. 18). Most impressive was that he did it all while playing in an abysmal offense. Now in Carolina, Anderson assumes the role left behind by the offseason departure of Jonathan Stewart. Christian McCaffrey tops the depth chart, but his game is based primarily around pass catching rather than carries. McCaffrey carried just 117 times as a rookie. Stewart, on the other hand, tallied 198 carries and six rushing touchdowns in 2017. Anderson in a similar role has RB3 upside. Ty Montgomery began 2017 as the lead back in the Green Bay backfield. He averaged 20 touches per game in the first three weeks before an unfortunate collection of injuries derailed his season and ultimately led him to injured reserve. In eight games, Montgomery totaled 273 rushing yards on 71 carries and three touchdowns, with 23 receptions, 171 receiving yards and one touchdown. He held a 54.7 percent Snap Share and 48.3 percent Opportunity Share despite exiting multiple games early with injury. His +12.9 Production Premium ranked No. 20 among qualified running backs. Packers coach Mike McCarthy has already admitted a committee between Montgomery and second-year backs Jamaal Williams and Aaron Jones is likely in 2018. With Jones suspended for the first two games, the first crack at the receiving/third down role will go to Montgomery. The wide receiver-turned-running back is made for this role. He possesses the hands and route-running of a wideout, plus the size (6-0, 216 pounds) to handle a between the tackles workload. His 100.8 (66th-percentile) Speed Score, 129.4 (91st-percentile) Burst Score, and 11.18 (74th-percentile) Agility Score all point towards a highly productive runner and receiver out of the backfield. Montgomery provides great value in drafts as the cheapest of the Packers running backs. I have a shocking stat for you – are you ready? Javorius “Buck” Allen finished 2017 as the No. 23 ranked running back in PPR leagues. RB23! He did this by rushing for 591 yards and four touchdowns on 153 carries, and catching 46 passes (60 targets) for 250 yards and an additional two scores. Allen led the Ravens in red zone opportunities with 32 carries and six targets inside the 20. While Allen’s efficiency is underwhelming, he has opportunity. The third down/receiving back role should be Allen’s. Ravens’ running backs combined for 146 targets in 2017, fourth most in the NFL. Danny Woodhead retired, opening up 39 additional target opportunities. Starter Alex Collins saw only 24 percent of the backfield targets. Kenneth Dixon may get a shot, but injuries and suspensions have hindered him over his first two seasons and he has already missed several practices due to injury this summer. Allen can be found at the very end of drafts or even on the waiver wire. He’s one to monitor as his receiving opportunities could lead to another top 25 PPR performance. Giovani Bernard quietly had a productive 2017 season even while working in one of the league’s worst offenses. He finished as PPR RB 27 with 458 rushing yards and two touchdowns on 105 carries, and 43 receptions for 389 yards and two receiving touchdowns. Bernard took advantage of late season injuries to Jeremy Hill and Joe Mixon, averaging 19 touches per game over the final five weeks. The 2013 second-rounder was efficient in his opportunities. He averaged 4.3 yards per carry, 5.7 yards per touch, and had a solid Juke Rate of 20.3 percent. Bernard also sported a +8.0 Production Premium. With Hill now out of the picture, Bernard has a stranglehold on the backup job behind Mixon. He is also uncontested to be the team’s passing downs back, giving him a solid floor in PPR scoring. The Bengals offense should be improved, so the number of opportunities for Bernard and the quality of those opportunities will be greater. A 10 touch per game average is a realistic expectation which gives Bernard high-end RB3 potential. An injury to Mixon would then bump him into the weekly RB2 range.